It happens. Requirements change. Now we want to allow selecting multiple genres for a movie. For this, we need a M-N mapping table that will let us link any movie to multiple genres. I tried to save existing Genre declarations on Movie table, by copying them to our new MovieGenres table. The line above with Execute.Sql does this. Then we should remove GenreId column, by first deleting the foreign key declaration FK_Movie_GenreId that we defined on it previously. This is because we still have mapping for GenreId column in our row. Error above is received from AJAX call to List service handler for Movie table. Repeating of error message originates from SQL server. MovieId column name passes several times within the generated dynamic SQL. After building, we at least have a working Movies page again. 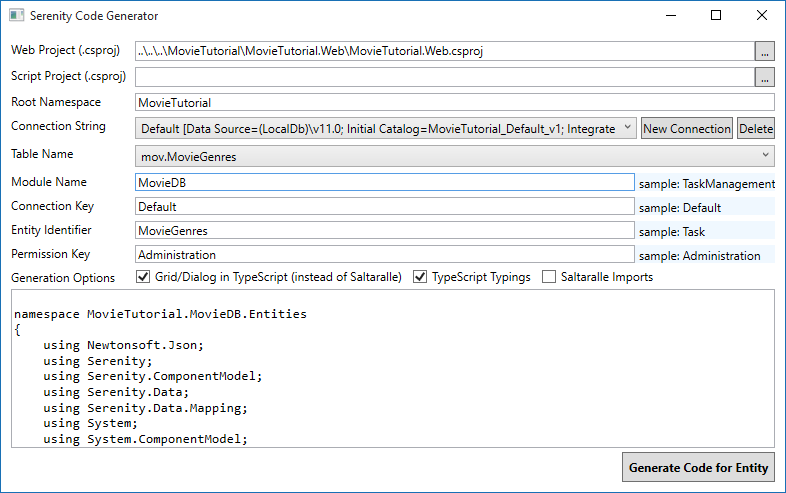 You can also remove CSS entries for s-MovieDB-MovieGenresDialog from site.less. Only leave last two files, MovieGenresRow.cs and MovieGenresRepository.cs. After building, run T4 templates to be sure, no T4 generated files related to MovieGenresForm etc. is left behind. You might have to add System.Collections.Generic to usings. Our property has [LookupEditor] attribute just like GenreId property had, but with one difference. This one accepts multiple genre selection. We set it with Multiple = true argument. This property also has NotMapped flag, which is something similar to Unmapped fields in Serenity. It specifies that this property has no matching database column in database. We don&apos;t have a GenreList column in Movie table, so we should set it as an unmapped field. Otherwise, Serenity will try to SELECT it, and we&apos;ll get SQL errors. This is an attribute which is specific to M-N releations that links a row in this table to multiple rows from another table. First argument of it is the type of M-N mapping row, which is MovieGenresRow here. Second argument is the property name of field in that row (MovieGenresRow) that matches this row&apos;s ID property, e.g. MovieId. Third argument is the property name of field in that row (MovieGenresRow) that links multiple Genres by their IDs, e.g. GenreId. LinkingSetRelation has a related Serenity service behavior, named LinkingSetRelationBehavior that is automatically activated for all fields with a LinkingSetRelation attribute. This behavior, will intercept service handlers for Create, Update, Delete, Retrieve and List and inject code to populate or update our GenreList column and its related MovieGenres table. We&apos;ll talk about Serenity service behaviors in following chapters. Previously, when we had only one Genre per Movie. 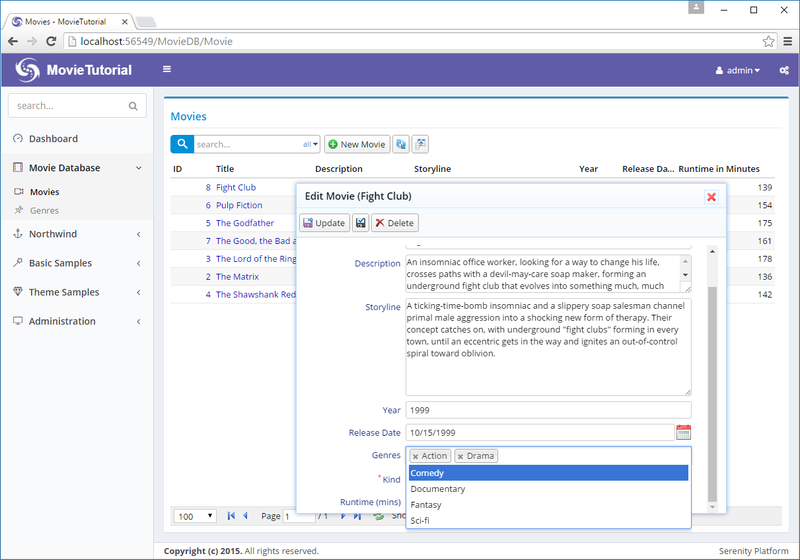 We could show the selected genre in a column, by adding a view field to MovieRow.cs. It is not going to be so simple this time. We would prefer genre names instead of Genre IDs, so it&apos;s clear that we need to format these values, by converting GenreId to their Genre name equivalents. Here we define a new formatter, GenreListFormatter and register it with Serenity type system, using @Serenity.Decorators.registerFormatter decorator. Decorators are similar to .NET attributes. All formatters should implement Slick.Formatter interface, which has a format method that takes a ctx parameter of type Slick.FormatterContext. ctx, which is the formatting context, is an object with several members. One of them is value that contains the column value for current grid row/column being formatted. As we know that we&apos;ll use this formatter on column with a List<Int32> value, we start by casting value to number. We lookup an ID in our Genre dictionary. It should be in dictionary, but we play safe here, and return its numeric value, if the genre is not found in dictionary. If we could find the genre row, corresponding to this ID, we return its Name value. We should HTML encode the genre name, just in case it contains invalid HTML characters, like <, > or &. We could also write a generic formatter that works with any type of lookup list, but it&apos;s beyond scope of this tutorial. As we defined a new formatter class, we should build and transform T4 files, so that we can reference GenreListFormatter in server side code.